Deer are a common problem in many yards, gardens, and landscapes, where they forage and browse on a wide range of plantings. Vegetable and ornamental gardens seem to be favorites of these animals, but many flowers, shrubs, and plants are at risk including tulips, hosta, yew bushes, and fruit trees to name just a few. 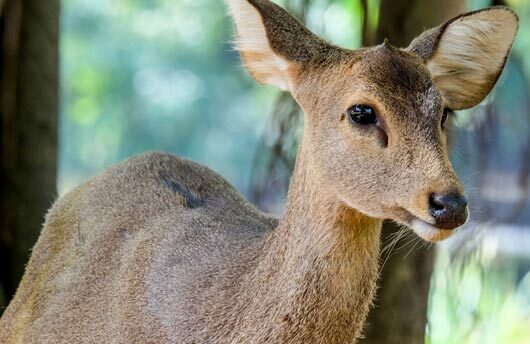 Considering an adult deer consumes about six pounds of plant material daily, you can easily imagine the kind of damage they can cause once they've established themselves in your landscape. Add that to the fact that deer can also carry ticks and you'll probably be looking for solutions to keep these unwanted visitors away. Unfortunately, deer management can be a frustrating challenge for homeowners. Deer feed all year long and quickly adapt to most home remedies and even some commercial products that claim to keep them off a property. The most practical approach to deer management for most landscapes is a repellent program that uses several different products. Bartlett's repellent programs are based on the specific time of year, amount of deer pressure, and client preferences. In the fall, we recommend a heavy film repellent that typically deters feeding for 90 days or more. For summer treatments, we use a product that leaves no visible residue, but requires application more frequently. All products used have been tested at our Research Labs to help ensure they effectively reduce damage to valuable plantings by keeping deer away.